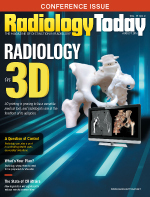 The Internet of Things may help radiology improve workflow and utilization. Workflow, equipment utilization, and patient satisfaction are becoming increasingly important. To enhance those areas and others, many people in the medical imaging field are thinking about how devices, medical supplies, staff schedules, and even patients can be coordinated through the internet. Often referred to as the Internet of Things (IoT), the concept has the potential to significantly improve health care delivery. IoT is still new to health care, but its use is growing. According to the Worldwide Semiannual Internet of Things Spending Guide, US businesses are projected to spend $232 billion on IoT hardware, software, services, and connectivity this year. Although most of that money will be spent in industries other than health care, Khan M. Siddiqui, MD, chief technology officer and CMO at higi (www.higi.com) in Chicago, with a faculty appointment as a visiting associate professor of radiology at Johns Hopkins University School of Medicine in Baltimore, says forward-thinking radiology practices need to take a closer look at how IoT can affect the overall patient experience. "For radiology practices, we all know that to survive and not get commoditized you need to provide value," Siddiqui says. "How are you providing value to your customers, both patients and referring physicians? If you look at what the hospitality industry is doing, people expect a similar type of experience, especially when they come into an outpatient servicing area. This is not traditionally what we think through in radiology. We tend to focus on our practice and providing clinical diagnoses, but now with more and more patient interest and patient-driven decision-making, you need to provide higher value services. One of the higher values is customer satisfaction, and [IoT] sort of plays into that space." Siddiqui says IoT integration can improve safety, efficacy, and workflow throughout the enterprise. Scanners, tables, and some inventory have sensors in them that communicate with each other, but they mostly exist in closed systems. Connecting those sensors to the internet can allow them to locate patients better, schedule equipment utilization with less downtime, and manage inventory more efficiently, Siddiqui says. For example, radiology workstations can be customized to each radiologist's preferences and ergonomics, while automatically authenticating access or logging out. Or a contrast injector can be automatically notified that a patient has a contrast allergy and immediately stop the contrast without human intervention. Radio-frequency identification (RFID) or Bluetooth low energy (BLE) tags can be used to provide real-time radiation dose information to clinicians. One caveat, however, is that IoT implementation requires planning, Siddiqui notes. "For example, suppose a patient is scheduled for an angiogram of the abdominal aorta," Siddiqui says. "When the order is placed, how does that information now propagate across the inventory management system, resources, and staffing to optimize the process for having the right people, the right equipment, the right medication, all ready to be delivered in real time when the patient is arriving on the table?" In this scenario, inventory that will be used during the procedure, such as contrast agents and catheters, can be automatically logged and have a restock order sent. They may have RFID or BLE tags attached to them, or they may simply be in a bin that has a digital counter tag. The necessary medical equipment, including imaging modalities, can be located and brought to the operating room. Where Siddiqui sees the most value, though, is in IoT's ability to track patients and ensure that equipment and staff arrive in the operating room when the patient does. In this way, space, equipment, and staff can be scheduled to reduce downtime and, importantly, increase utilization. Although privacy advocates may have some misgivings about such tight integration with the internet to schedule medical procedures and track patients from their homes to the hospital, Siddiqui says security can be adequately addressed. To start, many sensors and tags have tracking numbers attached to them, but they don't contain any patient information. The bigger question is whether an IoT system is designed for health care. "The standards are there on how to do it. The question really becomes the implementation process," Siddiqui says. "Some of the people who are trying to do this for the medical space are using the right techniques to do it. Some on the nonmedical side of things are using open standards to do it. I have an IoT scanning app on my mobile device that can tell me how many wearable fitness devices (such as FitBits and Apple Watches) around me are broadcasting, but it doesn't give me any information about the readings or things like that. All it tells me is the name of the device and the device ID and that's it. So they're not broadcasting patient information or clinical information from those devices." With some forethought, Siddiqui says, health care organizations can develop secure, efficient IoT strategies. Using hardware and software that's designed for health care is an important step, he says. Another is understanding where the organization's workflow breakdowns are. Ultimately, though, Siddiqui says an effective IoT strategy needs to be designed for the entire health care continuum. "[Organizations] need to plan it properly. It's not just device tags and things like that. It's also infrastructure changes. For example, what types of readers are going to read all of this information?" Siddiqui says. "[Radiology departments need to] align with what the rest of the hospital is doing in that space. It's really an enterprise-level decision about the technology you're going to use and how you're going to use the infrastructure to beef up all of those things so there's real-time information happening."